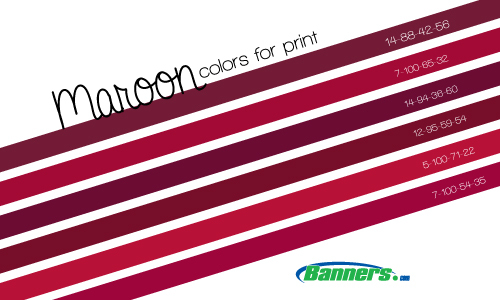 Maroon is one of the trickiest colors to print on vinyl banners. We put together a list of some common maroon CMYK color mixes that work well for vinyl banner printing. We recommend using one of these maroon color mixes when you design your files in Adobe Illustrator or Adobe Photoshop. Thanks for good advice for CMYK Colors for Printing Banners . i also agree that CMYK Colors is very important for designing.